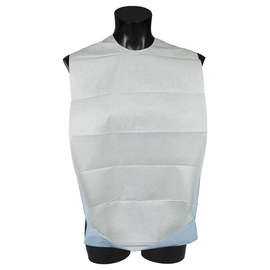 These clothing protectors have self-adhesive pads which will stick to most clothing items and which attach over the back of the shoulders to ensure maximum protection against fluids and food spillage. Quick and easy to use and dispose. They are made of white recycled tissue and coated with a blue laminated plastic.